January Favourites || A Link Up! 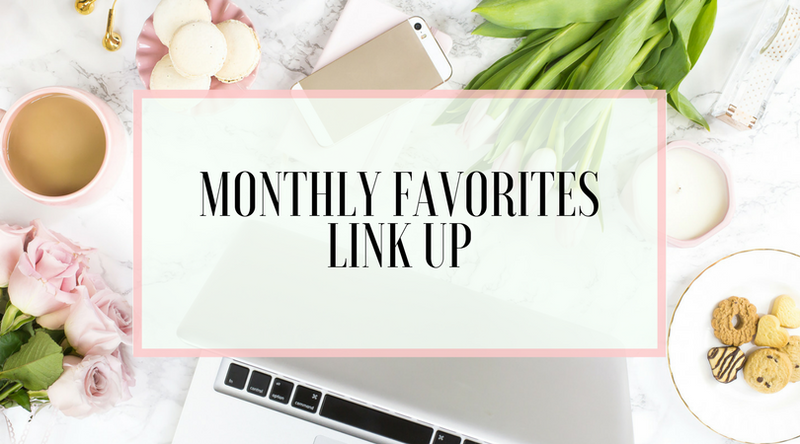 Make sure you check out each of these ladies' blogs for their January favourites! Add your favourites to the comments below, too! But really, I miss blogging. I miss sharing everything with you. Mostly, I miss the community and connections that I made when I was really in the swing of things and posted 2-3 times a week. I've joined a Facebook blogging group with the idea that I'll find inspiration to post, but to be honest, it's all about finding, or making, the time to create. I'm certain that I can stick to a monthly blog post, haha! So here goes! We didn't go anywhere this month, but I did go to my friend's house for our Christmas gift swap and brunch. That was fun! Last night's dish, for sure! It was totally not healthy, but it was comfort food night. Rice, gluten free pasta, tomato sauce, canned corn, an onion, spices, ground beef, and LOTS of cheese on top. It actually turned out really well for something that was thrown together so last minute and didn't contain any vegetables. Definitely will make it again, and try different variations of it. I haven't worn anything fancy, but being back at work makes me appreciate how comfortable my pjs are, haha. It's my favourite! 'm currently reading The Virgin Cure a page or two at a time because I fall asleep after that. It's really good though and I really like it! I'm just trying to figure out this whole mom thing while working full time again. Abiageal's baby book from Lucy Darling. It's so cute and really easy to keep up with! I really recommend these baby books to anyone who asks. 100% my BeautyCounter day and night creams. They smell good and make my face feel so refreshed. I can also wear them knowing that I'm not putting so many harsh chemicals on my skin. Well, our last date night was on New Year's Eve. We went to Original Joe's for dinner then Rob went home and passed out (still recovering from night shift) while Abby and I went to a party for a couple hours. My favourite mocktail is actually a Whole30 recipe! The rosemary berry splash. Raspberries, rosemary, lemon, and sparkling water. So good. We don't have Target in Canada anymore, but I did find some discounted leggings from Simple Addiction. $4! I'll let you know what they're like when they arrive. Seeing Abiageal when I get home from work. So cliche, but it's the best feeling! My favourite food this month has been my smoothies. They keep me going at work until I can have a break, and some days it's a couple hours until that can happen. I've also been adding some chia seeds and unsweetened vanilla almond milk instead of coconut water. What was the best thing that happened to you this month? Welcome to parenthood and the holidays where I didn't find any time to blog, haha. Here's 2 months of updates, while she's 10 months old in like, 2 days. First Halloween! She was a pumpkin for the party and about a half hour of trick or treating. She wore a cute little onesie from Carter's during the day when we went and got her foot prints painted on a popcorn dish! Sleep regression did not pass go, it did not collect $200. It hit us and stuck around even to today. She mimicked me and said "dada"! Abby started to give me a break and would play independently with her toys around the living room. Started to stand without being held/help. Generally, she gets the spoon full of food into her mouth but we have to give her another pre loaded spoon in order to get the first one back, haha. Favourite things: Brown Bear Brown Bear What do you See?, our dogs, grilled cheese sandwich, and daddy. 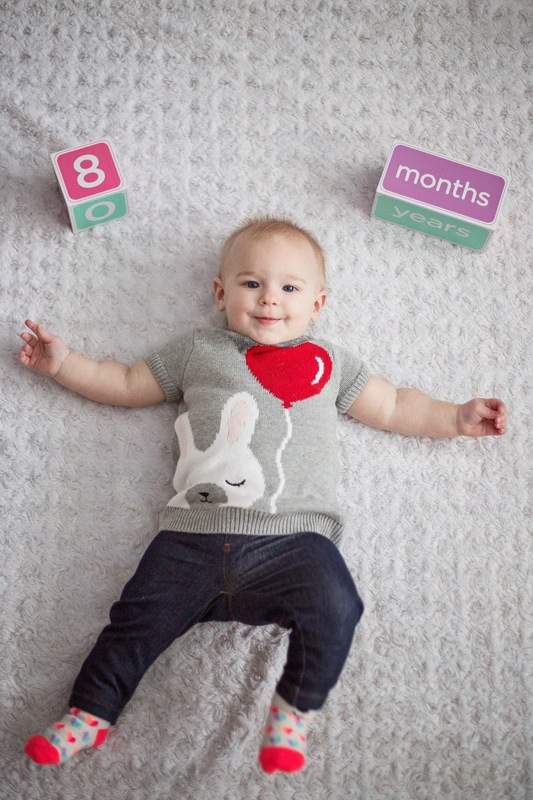 Still fitting into 6-9 month clothes. As you can probably tell from the photo, it's getting more difficult to get her to lay still for these, haha! Abby graduated from 2 teeth to 5. She has 3 bottom, and her two top teeth! I flew solo with Abby to Vancouver to visit my new niece, and Abby's new baby cousin (they're 1 day away from being exactly 8 months apart! ), and the flights went really well. It felt like a breeze compared to our Scotland trip. Decided to give me a heart attack by disappearing while at Aunty's house and we found her at the top of the staircase (a whole 9 steps!) all by herself. She was following their cat. Baby gate was promptly brought out of storage by Uncle! Abby can walk with help! She can do it if you're holding her hands, then on the 30th of December, she received a push walker from her Grandma and Grandpa, which she pulled herself up right away and went zooming away. She's decided that opening cupboards in the kitchen is SO MUCH FUN. We now gate off the living room until we buy child locks or until I find a better place for our cleaning supplies from the kitchen. She growls. We hang out with our dogs too much, and she finds it hilarious when Spencer growls. I think it also really took off after her cousin. Nenna, showed Abby her growling dinosaur. Started sleeping at night again! No more hourly wake ups, and is down to 1-3 wake ups. Really just depends on her day and what's going on. Abiageal can clap! She also signed for "milk" (formula in this case). It's not 100% used in context and it gets confused with waving "bye" but we're getting there. Favourite things: Definitely Gunner, family - she was on cloud 9 during the holidays with all the attention and visits with her favourite family members, cucumber - it feels so good on those sore gums, and finding floor treats. She gives us a run for our money when we go to another person's house or place, because she really does find every single piece of styrofoam, tape, foam, rocks, dirt, etc..
After Remembrance Day (November 11th), I was waiting for my EI (maternity leave paycheck) and assumed it would be late because of the statutory holiday because the offices were closed. Log on to find that they made the decision to cut me off at the end of October because of a previous open claim, and they say you can only claim so much in 50 weeks. I called, in tears, and that's what I was told. I filed a reconsideration because I was told at the beginning of my maternity leave that while it said October 31st was my end date, I'd be fine until February 1st. We were left with only Rob's income for November and December, and forced me to go back to work for January 8th. I finally came to terms with Abiageal being in child care, after a full day of on/off crying because I didn't want her to be in someone else's care. Today is day 3 of daycare for her! We found one that we really like and that made all the difference in coming to terms with it. She's extra tired and sensitive when she gets home for the day, but we're all still adjusting. I go back to work this coming Monday so I'm trying to use my childless time wisely in preparation for that. We took our first vacation to Glasgow, Scotland and she was actually a pretty good little traveler! She slept for most of the 3 plane rides there, but it was a little more rough on the 3 plane rides home. Abby is full on crawling now! She's slow, but she does know how to disappear quickly when I turn away for a minute. On that note, separation anxiety has kicked in. She wants Rob, but usually screams and cries when I leave the room. She's hard at making decisions, just like me, haha. 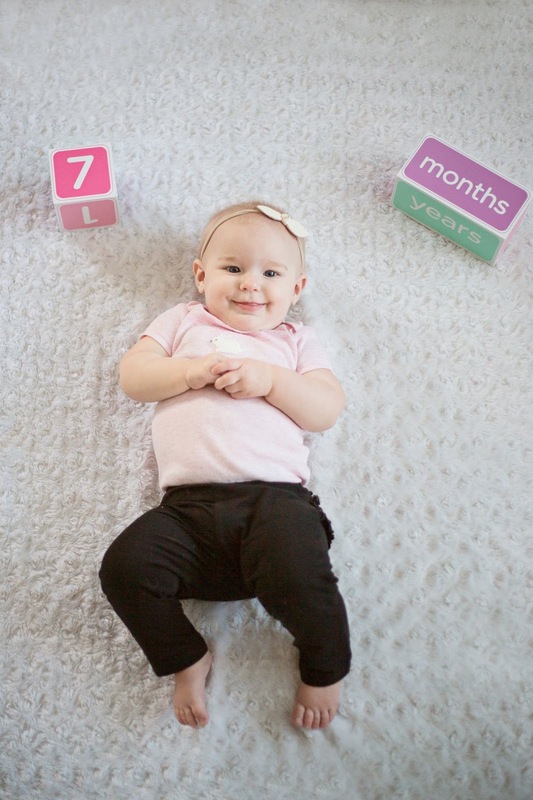 The same day that she started crawling, she started pulling herself up to stand on things. After a full 4 weeks of toppling over like a downed tree, she's finally getting the hang of slowly dropping to her bum to get herself down. Her screaming stopped, but it's back! We both got a head cold for the first time (for me since I was 15 weeks pregnant!) but we survived! She had a fun sleepover at my Aunty Kim's and apparently didn't sleep very well, but that's typical lately. From 10 hour nights to the occasional 6 hour stretch before waking up for a bottle and diaper change, but she'll generally go back down pretty easily. She's finally started to hold her own bottle! The Dr Browns bottles are a little harder for her to hold, but the Avent ones are easier. Abby tends to not like purees and prefers little pieces of food. Yesterday and today, she enjoyed a chicken and strained vegetable puree though, so who knows! It was so nice going on our first family vacation and things went better than I was anticipating. I worried about money and about being in a different country all together with what's been going in the world. We're home, we're safe, and we had a great time. Next on my bucket list is the wizarding world of Harry Potter but Rob disagrees, haha. 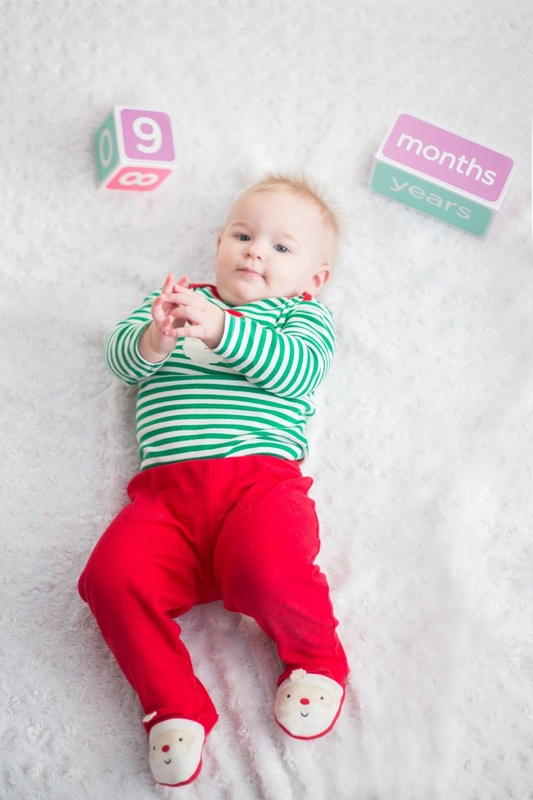 As always, Abby's monthly photo is courtesy of Treasured Forever Photography! I'm Nicole, living in Alberta, Canada with my husband, dogs, cat, and our baby girl. We got married in June 2013, and this is my life as a now Maxfield.